Last night TMB & PRB Entertainment presented “Fight Night at the Scottish Rite 2” a ten-bout card that took place at the Scottish Rite Theatre in downtown San Antonio. 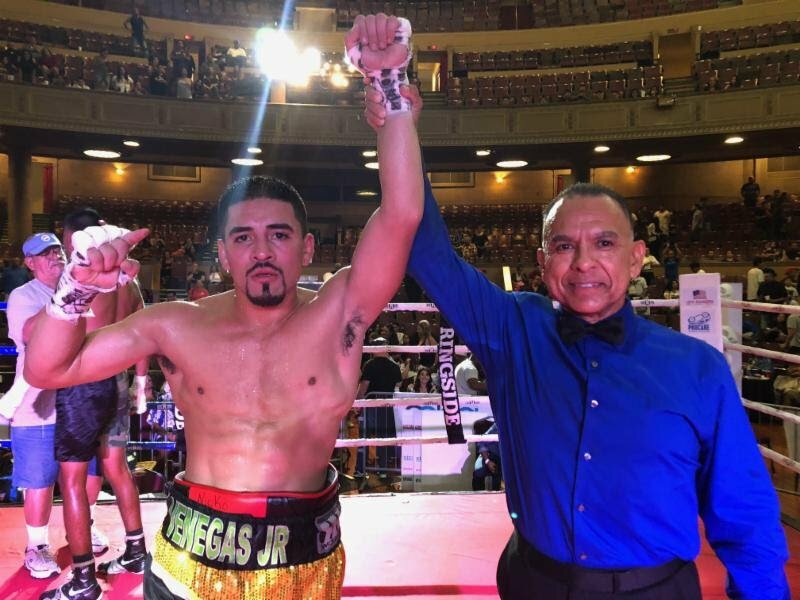 In the six-round main event, local fighters, Gilbert Venegas and Armando Cardenas gave the fans a crowd-pleasing showdown. 17-year old amateur standout Richard Medina made his highly anticipated pro debut. He made easy work of a game Johnathan Ewer. Medina’s speed and power was on display as he landed several combinations in the opening round, dropping Ewer twice. In round two, Ewer was in survivor mode, but was unable to escape the attack of Medina. An overhand right dropped Ewer for good in round three, ending the bout at the 1:54 mark. In a very entertaining bout, Xavior Wilson and Christian Santibanez, who had bad blood going into the fight, put on a great show for the fans. In the early rounds both fighters were landing solid blows to the head and body. A straight right hand from Wilson hurt Sanibanez toward the end of round two. Sanibanez recovered well and came back in round three, landing some nice hooks of his own to the head of Wilson. The fight was going back and forth as both fighters were giving the fans their money’s worth. Though both fighters had their moments, the fight ended in a Majority draw. Scorecards read 58-56 for Wilson and 57-57 twice. The decision upset Sanibanez and he stormed out of the ring, leaving the photographers empty handed. In a close fight, Luis Villareal edged out Stetson Horne over four rounds. Villareal applied pressure from the opening bell, forcing Horne to box from the outside. Villareal was the busier fighter who landed the cleaner shots and won by unanimous decision. Scorecards read 39-37 for Villareal. San Antonio native, Gregory Morales looking sensational in his bout with Jorge De Leon. Morales was landing hard power shots to the body and head right out the gate. A solid right hook dropped De Leon at the beginning of round two. After De Leon got up, Morales went for the kill and landed a flurry of punches, forcing the referee to stop the bout at the 1:10 mark of round two. Los Angeles native, Johnathan Rice used a nice jab to win his bout against a game Terrel Woods. At the end of round two, Rice dropped Woods with a nice right hook, forcing the ref to give him a standing eight count. Rice would cruise to a unanimous victory. Scorecards read 60-54 all in favor of Rice. Local fighters, Steven Ramos and Fabian Cancino went the distance in their respective matchup. Both fighters started off slow but started to engage more toward the later rounds. Ramos landed more power shots throughout the fight and won by unanimous decision. Scorecards read: 40-36 across the board for Ramos. Fighting for the second time in 2018, Victor Pasillas dominated his opponent Manuel Rubalcava from the opening bell. The onslaught started when Pasillas, a southpaw, landed power shot after power shot in round one. A devastating right hook to the body by Pasillas sent Rubalcava to the canvas and ended the bout at the 1:55 mark of round two. In a battle of local middleweights, Eddie Tigs and Patrick Clarke went the distance in a 4-round bout. Tigs was the boxer using lateral movement to pick his shots, while Clarke applied pressure landing power shots. Both fighters had their moments, but the fight ended in a split draw. Scorecards read 39-37 for Wilson and 38-38 twice. Previous boxing news: What Next For New Champ Shawn Porter?